After spending nearly a week on the West Coast (see blog on LA/Pasadena) and battling an excruciating sinus infection on the way back on the plane the night before, I mustered enough energy on a beautiful spring day to trek down to Georgetown in order to use an online coupon for an Italian restaurant before it would expire a few days later. Having such an affinity for Italian cuisine, I could not help myself but purchase another coupon to sample the different eateries that could offer dishes as authentic as those I savored in the Tuscan region last summer, much like searching for a definitive interpretation and recording of a piece of music. Visiting Georgetown has some serious challenges, mainly finding and paying for parking. Ideally, street parking is the best since they are much more reasonable (free on Sundays) than the flat-rate garages that jack their rates up knowing that the public will have some serious challenges finding a space. Since Georgetown is not metro accessible, one has no choice but to drive and park there, wishing that the Parking Gods are working to his favor. And they were when I paid my visit. I had to make one circle around the area before a pedestrian waved his keys to me before getting in his stretch limo and pulling out. Even better, the restaurant was just the next street over. 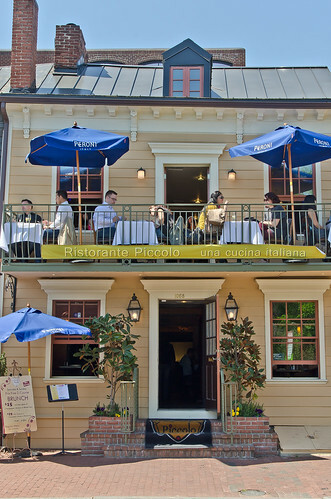 Ristorante Piccolo is the sister restaurant of Tuscana West (see blog), and it occupies a quaint converted row house along with many other restaurants on that row. Immediately, you notice the upstairs balcony with a few tables jammed in that rather narrow space. Upon entering, I was told that by the young hostess that there were no tables available, except for those in a dark cavernous back room. I requested a table close to the window so I could take some decent shots. An older man, in chef’s garb, told me that the upstairs was only for reservations. Being Easter Sunday, I did not protest and made my way to the bar as the holding area. After 30 minutes, the young hostess told me that a table on the balcony was available – Yay! While I was waiting for the table to be cleared, the same older gentleman started to interrogate me on why would I want to take pictures in his restaurant stating that customers were already complaining about my photo-taking – I was puzzled as I had only taken a shot of an inner dining room with no-one in it. After explaining that I wrote a food blog, he relented and showed me to my table. For the next course, I decided to try out the restaurant’s signature dish – Porcini Agnolotti. 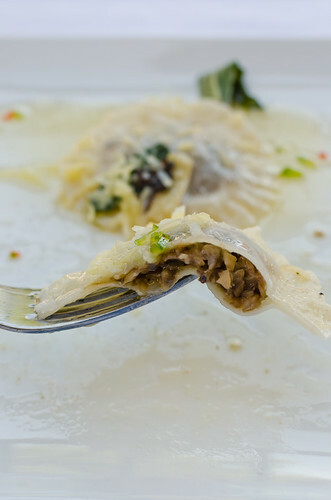 These are Northern Italian style raviolis that have been stuffed with chopped Porcini mushrooms that exude a rich woodsiness while having a meaty texture in each bite. 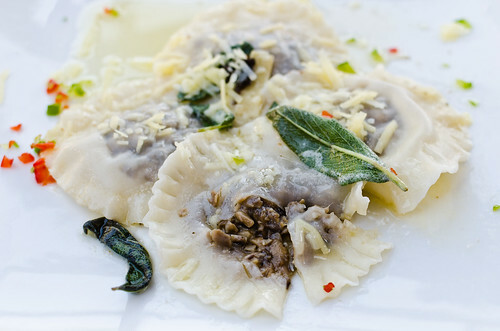 The covering pasta was a light semi-translucent sheet that was more akin to wanton skins than fresh pasta. The sage butter sauce provided the slight resin-like mintiness and the light creaminess in the sauce. A hint of pecorino cheese added the further richness along with some nuttiness to these light heavenly pillows. I must admit that four of these agnolottis for $18 was short on value for money but they were worth every bite. Better Second Act. Seafood Pasta in Parchment Paper arrived as my main course, which was served by Mr. Chef himself. Strands of al dente Spaghettini were covered by a tomato sauce that was made aromatic by fresh basil leaves, spiked with dried chili peppers, and enriched by seafood stock. 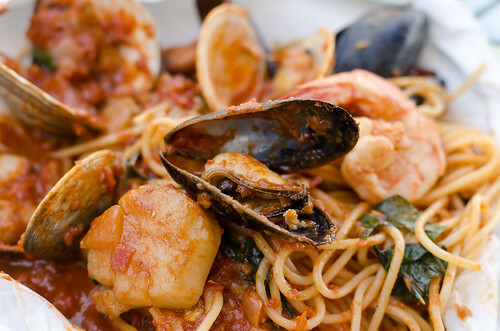 My dish had pieces of juicy and plump seafood – scallops, shrimp, mussels and clams. This Sicilian classic is usually baked in a parchment paper until the pasta has absorbed the sauce and the seafood cooked. I must admit that I thoroughly enjoyed this restaurant’s rendition with its tasty sauce and fresh seafood. However, the parchment paper lacked any burnt marks thus making this critic wonder if the dish ever made it to the oven. Good Third Act, no doubt. Mr. Chef came up and took my plate away and asked me for my dessert order. Since the restaurant offers the ever-present Tiramisu in half orders also, I decided to try a small portion of it. He came back later apologizing that it had sold out, and he was really being super nice with me – hmmmm. 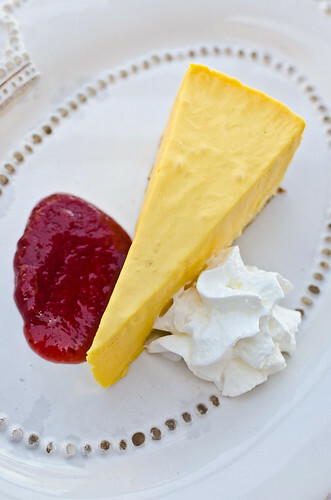 Using my newly found trusty Yelp application on the smart phone, I decided to order the Mango Mousse cake that many reviewers had raved about. And rightfully so. It was a light mousse that was still slightly wobbly (not too much gelatine), and it packed that rich yet unmistakable exotic mango flavor sitting on a layer of sponge cake. Not being much of a sweet-tooth person, I was uncharacteristically diving into this with full gusto and savoring every forkful and morsel. I feel that most desserts do not warrant my attention unless the calories are worth eating, and at this point I was not counting a single one. Great Finale – Bravo. 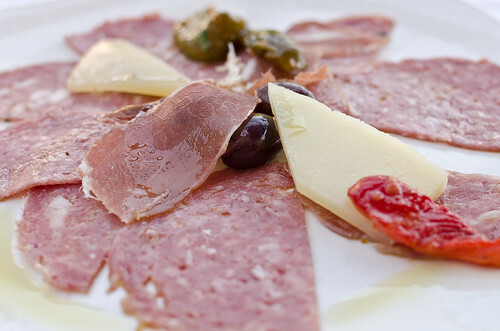 Despite a faulty start and slow service, I enjoyed the dishes that I had savored at Ristorante Piccolo that day. Just like any relationship, if you can overlook an overbearing personality and slow response to one’s needs, things can warm up and get better with time or in this case, with subsequent courses. If you are patient enough, the experience may result in hitting the jackpot, like the Mango Mousse that won me over at this Italian Tratorria. If I happen to be strolling in Georgetown and battling hunger pangs, I will make another stopover to savor some of their tasty and well-made dishes, making sure I have room for that heavenly dessert.